On an oddly warm and pleasant Wednesday October afternoon in Hamden, junior forward Eamon Whelan continued his hot streak with another golden goal score for the Quinnipiac Bobcats (6-4-1, 4-0-0 MAAC) in overtime to lead them to a 1-0 victory over the Siena Saints (3-7-3, 2-3-0 MAAC). It was a very competitive and physical game against the rival Saints. Within the first 10 minutes of the game, two injuries occurred, one to senior captain defenseman Derek Parker who was tripped up on a play going for the ball on the right side of the field in the third minute of play. The other to sophomore defenseman Simon Hillinger just two minutes later, who was unintentionally pushed out of bounds hard on a play in the Quinnipiac zone. Both were taken out of the game, giving opportunities to other players such as junior midfielder Evan Hughes and senior midfielder Christian Casagrandas, who both got the most playing time that either of them has seen all season. Quinnipiac head coach Eric Da Costa shared his thoughts on his unexpected substitutions. “Some players have a bigger role than others but your role is important and it’s valuable to the team….their teammates know, guys who are consistent starters and you see someone come off the bench, they’re gonna give you a full effort and that’s what we saw from quite a few guys today.” The Bobcats struggled throughout most of the first half, lacking communication and couldn’t salvage the chances they had. Their best chances came in the middle stages of the half, one opportunity on a steal by freshman midfielder Oriac Vila Rotxes who had a great look at goal, but it went wide right. Another came by way of freshman defenseman Jordon Bennett, who drove up the left side and made a quick cut to the middle of the field, unfortunately the shot was wide and traveled out of bounds yet again. These were opportunities that the Bobcats were not able to capitalize on, the game went to halftime scoreless. They turned their play around for the better in the second half, finding more scoring chances. The Bobcats were able to manage 6 shots on goal in total while Siena was not able to get a shot on goal. 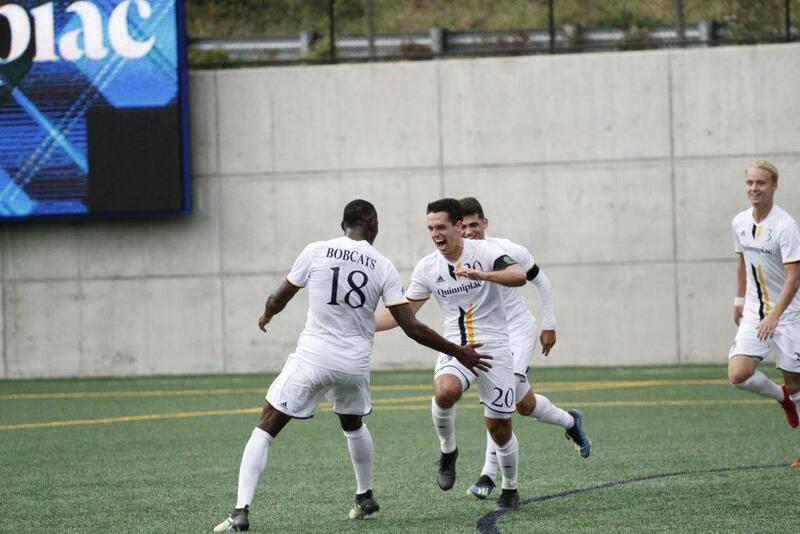 The Bobcats had many chances again, the best one when Jordon Bennett almost scored on a high, arcing kick that bounced off of a Siena defender and hit the crossbar, causing Siena goalie Greg Monroe to jump up to attempt to deflect it away. It was the closest opportunity to a goal that the Bobcats had seen so far in the game. Siena struggled to find the goal today as sophomore goalkeeper Jared Mazzola did not need to record a single save as the Bobcat defense powered up, allowing just 6 shots total compared to Quinnipiac’s 23. The hard-fought battle between these teams went into overtime. Quinnipiac had the upper hand as they had lots of chances to score. It was Whelan who broke through in the 99th minute, wide open in front of the net to put it in to seal the victory for the Bobcats. It was his 8th goal of the season and his 4th in his last 4 games. He leads the MAAC in goals scored on the season and holds a comfortable lead in points as well. Next up on the schedule: Quinnipiac takes to the road for another MAAC showdown with the Iona Gaels on Saturday afternoon at 3:00pm. You can watch that game on ESPN3 or stream it live on the ESPN app. The Bobcats will be looking for their 7th consecutive win and to keep improving the important conference record. Siena now falls to 2-3 in the conference and will try and break their 3-game losing streak when they face the Fairfield Stags at home next Wednesday at 3:00pm.